This months magazine will not be delivered until around 10/11th of Feb as I am away on an 8 day Ignation Spiritual retreat organised at very short notice and wont be back until the 9th Feb. There will be a few paper copies in the post office if anyone wants one and the electronic copy has been circulated and will be available to download from http://www.allsaintsnocton.org.uk/ from tomorrow. Last Nights Nocton Dairies Village Meeting. 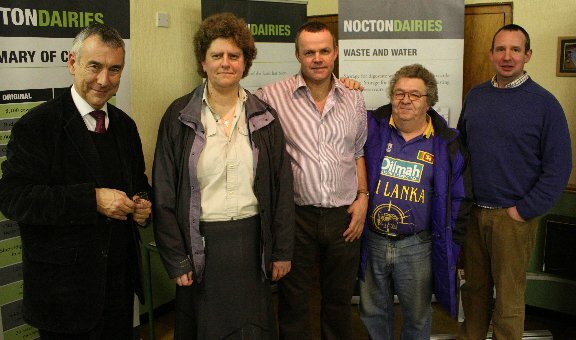 On 19th January the Parish Council hosted a meeting between Nocton residents and representatives of Nocton Dairies. The aim of the meeting was to provide residents with an opportunity to ask questions about all aspects of the proposed Dairy development on Nocton Heath. The meeting was independently chaired by Liz Murray (one of the Church Wardens) and was attended by some 100 people, the overwhelming majority of whom were from Nocton. After short presentations from Peter Willes of Nocton Dairies and Andrew David, a Nocton resident who outlined some of some of his concerns about the proposal, there followed a lengthy and detailed question and answer session covering environmental, traffic, spreading of digestate, public health and economic issues associated with the Dairy development. There were also a number of questions and comments from residents about Nocton Dairies’ recently submitted application for an underground digestate pipeline from the Dairy to Wasps Nest. Left: Andrew David, 2nd Left: Liz Murray, Centre: Peter Willes, Right: David Barnes. The discussion was lively and generally very good-natured and covered a wide range of issues and concerns about the Dairy. At the conclusion of the meeting Liz Murray received a vote of thanks for the effective and very fair way in which she had chaired the meeting. Wed 19th Jan. The Nocton Dairy Q&A Session with reps from Nocton Dairies & Opposition Groups. In the Village Hall starting at 7.30pm. Independently Chaired by our own Dr Liz Murray. This event has been arranged to take place in Nocton Village Hall - it is reserved for local Nocton residents only. 9.40 pm - Closing remarks. Residents are invited to submit written questions in advance of the evening. After these have been answered, questions and comments will be taken from the audience on the night. Thats Thursday, so remember to take all those decorations down. Its also the 6th of January which is this date the Anglican church celebrates the Epiphany - that is when the Kings, Magi or Wise men visited the infant Jesus in Bethlehem. The day that he was revealed to the world in all his glory as the Son of God. The church is nearly stripped now after the festival, with just a few things to put away. I have all the decorations not already removed in bags at the church so i'll get them back to you ASAP. We are going to run it again next year so get those thinking caps on to refresh your trees with updated ideas. It will be quite a task though as they were all so good! Thankyou. Well 2011 is here at last so here's wishing all of you a happy and prosperous New Year. Lets hope we've seen the last of the bad weather - I suspect not though. I decided not to make any of those (last one day only) resolutions as my will power is abysmal, so I can only be dissappointed. I've been a little quiet on here over Christmas as many of us had a very heavy workload running up to the festivities and it's actually quite nice to switch off and wind down for a few days, so I did just that. Anyway, the January Parish Mag is now finished and in print, copies can be downloaded from here shortly. We have a new advertiser this month, Mandarin Leisure. Martin who runs it is keen to push the sport of Nordic Walking along with all the other things he offers to get us back into shape after all the seasonal excesses, so if your interested there will be a proper flyer distributed with this months mag as well to give you more info. Enjoy the next couple of days off before work resumes.